John Gunter, from whom the town got its name, came from the Carolinas in 1785, just ten years after the signing of the Declaration of Independence. He was a Welshman and lived among the Indians as a trader. He married a Cherokee maid and amassed a fortune in land, money and slaves. His children married into the white race and became prominent in both the Indian Territory and the land that was then a part of the State of Georgia. Among Gunter's descendants was the noted humorist Will Rogers, whose grandmother was a Cherokee Indian. Rogers' family went west with the great migration. Gunter operated the first ferry on the river here in 1820. There were two or three white families in the vicinity when the Indians ceded the land south of the river to the United States in December 1835. Gunter owned the first painted house in the new county, and incidentally the first house in Gunter's landing (later to become Guntersville). 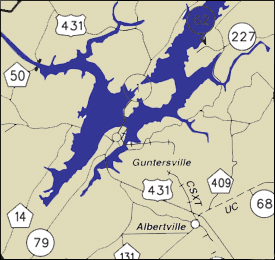 An impoundment of the Tennessee River, Guntersville Lake is known for its diverse fishery and abundance of aquatic vegetation. The lake is full of hydrilla, milfoil and grass, providing gamefish with an abundance of habitat. In combination with the vegetation, the lake is full of submerged stump fields that were left after the forest was cut before flooding ccurred.Guntersville Lake is a premier angling destination. Due to its robust and diverse fishery, numerous tournaments are held on the lake. There is a tournament almost every weekend, from local clubs to national tournaments. The GUNTERSVILLE MUSEUM is located in the historic rock Armory. With its location at the southernmost point of the Tennessee River, Lake Guntersville provides a unique vantage point on history and the culture of the region. As a living repository, the Museum offers visitors a chance to explore everything from Native American artifacts to interesting local personalities. 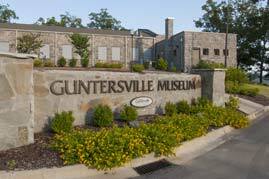 With 10,000 years of history and hundreds of objects and exhibits, it's a great way to explore Guntersville. LAKE GUNTERSVILLE STATE PARK Situated within the pine studded woodlands and adjacent to the reservoir shoreline is this beautiful park that blends with the serenity of nature. The park has an 18-hole championship golf course, a full-service restaurant, a beach complex with a rental pavillion and ample parking, fishing center, hiking trails, and nature programs. EAGLE AWARENESS is a long-standing tradition at Lake Guntersville State Park with more than twenty years of offering exciting programs and guided field trips. The program was started not only as an activity that people of all ages can enjoy, but also as a way to educate the public to the importance of protecting our most valuable treasure, the Bald Eagle and our wildlife, and their habitat and natural environment. 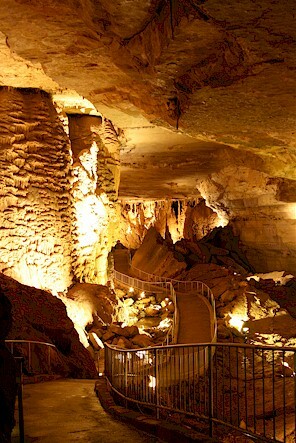 BUCK'S POCKET STATE PARK (camping) and CATHEDRAL CAVERNS STATE PARK are nearby. The Alabama Mountain Lakes region is a natural selection for fun! Enjoy some of America's finest sports fishing and camping. Experience the breathtaking natural beauty that offers endless opportunities for adventure and relaxation. WENKER'S VINEYARD is one the of finest "U-pick" muscadine and scuppernong vineyards in Marshall County. Jerry Wenker, a Master Gardner, has nine years of experience growing and cultivating muscadine and scuppernong grapes. Wenker’s Vineyard is proud of their history and involvement in the Alabama grape growing industry.